"Everything Is Going To Be All Right…" That's what Lieutenant Terry Metcalfe keeps telling his friends and co-workers. A hero to the public, just months ago he successfully prevented the veritable destruction of human civilization at the hands of terrorists from the warlike Qraitian Empire. But Metcalfe has changed, grown unhappy with his role as an officer in the Confederate Navy. Distancing himself from his friends, he's decided to join a religious sect which believes it's literally found God living beneath the surface of the far-off planet Eleusis. And to be sure, there's something there: an alien intelligence which reaches out to the young Lieutenant and offers him the power to protect everything he loves. But is Metcalfe finding the spiritual fulfilment he's sought so long, or is he falling under the spell of a malevolent new enemy? Steven H. Wilson's original science fiction audio series, The Arbiter Chronicles, has captured the imaginations of audiences for over a decade. Winner of the Mark Time Silver Award and the Parsec Award for Best Speculative Fiction Audio Drama, it's character-driven space opera in the tradition of Heinlein's The Rolling Stones and Joss Whedon's Firefly. Drenched in adventure, humor and sexuality, Unfriendly Persuasion joins its predecessor, Taken Liberty, in bringing new depth to the popular audio drama series. 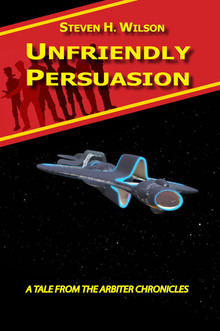 We will send Unfriendly Persuasion - A Tale from the Arbiter Chronicles to your Kindle at . Unfriendly Persuasion - A Tale from the Arbiter Chronicles has been sent successfully to your Kindle!